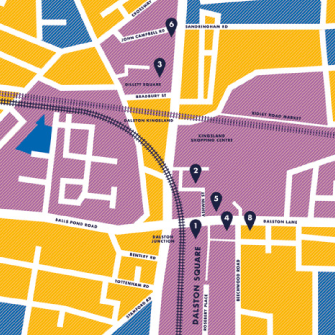 Fun and Free things to do all over Dalston! Make your own unique characters come alive with this puppetry workshop. Using recycled and household items, make your own crafty characters. Whether your child wants to be a superhero or wants to ride a unicorn, we’ve got it covered: Massimo Fenati’s magic pencil will reveal their true selves in just a few minutes! Work with a local artist to turn a blank tote bag into a colourful work of art. 11AM–12PM: Bollywood Dance - Learn how to dance Bollywood style or enjoy the show. 11AM–2PM: Hackney Playbus - Under 7s can play away at this fun session. 12–2PM: Lucky Dig - Dig in a pit of compost to find the hidden vegetables. 11AM–12PM: Under-5s Rhyme Time - Come and meet the aliens that have just landed on the library roof! 12–2PM: Henna Tattoo Art - Try out temporary henna tattoo art. All ages. 2.30–4PM: Family Film Club - If you need a break from all the action, relax with a bag of popcorn and enjoy the movie! A fun circus based workshop from Guinness World Record Holders Marawa’s Majorettes! Come and learn new tricks, get active and have fun. Join in an afternoon of free art, gardening and pizza-making with the Dalston Curve Garden team. Pop in to our pop-up playground to play, build and create! Try ping-pong, table football, giant jenga and giant chess. Play giant chess, backgammon and many more unique games from around the world. For family fun outside of the festival days you can visit the Evergreen Adventure Playground at Beehive Close where children aged 5-15 can join in free, supervised, challenging play. Tuesdays to Fridays 4-7pm and Saturdays 12-5pm. An interactive parent and baby class combining original tunes, folk songs from around the world with a few dance moves and a lot of shaking! Accompanied by cello and drum. Using drama explore current issues through the medium of storytelling. You will also have the opportunity to make your own props through arts & crafts. 11AM–4PM: Stars n Stripes - Bring along your bikes, learn road cycle safety and have fun weaving around obstacles and learning new skills. 1–2PM: Roma Gypsy Dancing - Learn some moves and watch an amazing performance from the Yagori Dance company and celebrate Gypsy, Roma, Traveller History Month. 2–4PM: Hackney Play Streets - All ages can come and play outside, with pavement chalk, skipping ropes, space hoppers, hula-hoops and more! 11AM–12PM: Under-5s Rhyme Time - We are going to the moon! 12–4PM: Summer Reading Challenge - Join us for the early launch of the Summer Reading Challenge. Discover space and explore moon landscapes! 2–4PM: ELCAF presents - Join Jesse Hodgson, author and Illustrator of "Pip and the Bamboo Path" picture book to create your own stunning illustrations. 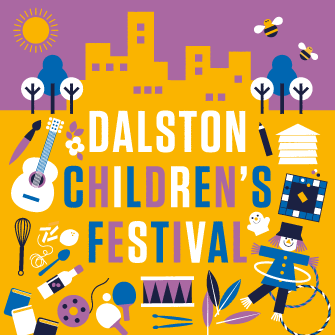 A relaxed day of children’s activities, including drag storytelling, sports and face painting. Aimed at LGBTQI+ families in Hackney, their friends and allies, bring along a picnic and enjoy the sunshine. Indulge yourself in a world of sparkles, feathers and sequins to make carnival headdresses at this fun workshop led by Tropical Isles carnival group. Is your child a secret agent, superhero, princess or dragon? Let us draw them a bespoke caricature. Workshop with illustrator Sara Pittaluga. Pop in to our pop-up playground and play, build and create! Try ping-pong, table football, giant jenga and giant chess. Learn about the Caribbean and make Caribbean summer inspired crafts including colourful palm trees and patterns. For ages 6+. 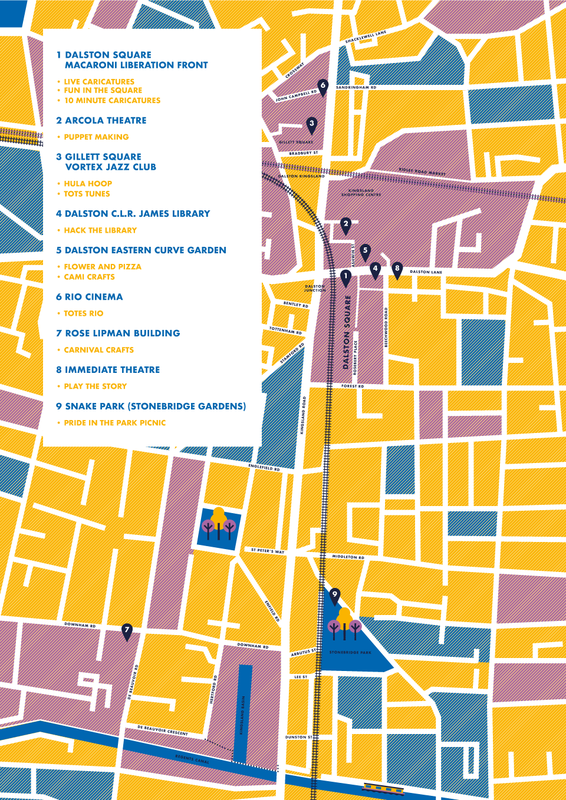 To help you get around, view our map and find the number of the event you are interested in. Download the full programme of events at this year’s festival.